Wharf Reflections, by Suprada on Flickr. Wharf Reflections, Monterey Wharf, CA. One last photograph from the first night of my night photography workshop with Harold Davis. 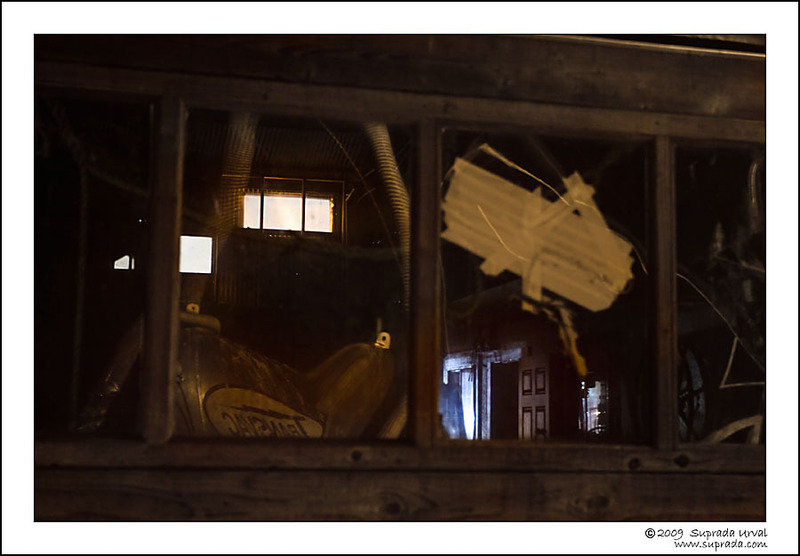 I was attracted to the reflection on one of the wharf windows. There was also a light inside which made this fascinating. This is one of my first photos to use the LAB color space and editing techniques taught introduced to me by Harold Davis\’ workshop. After the workshop, I got hold of a copy of Dan Margulis\’ \”Photoshop LAB Color: The Canyon Conundrum and Other Adventures in the Most Powerful Colorspace\” book. As I am reading through the book and applying some techniques, I am quite blown away by what I can achieve. I love how I can subtly enhance color / sharpening etc. I will continue experimenting in the LAB colorspace. For more about my workshop experiences, you can read this post. Question: How many people do you see in the photograph? The Wharf, by Suprada on Flickr. The Wharf, Monterey Wharf, CA. One more photograph from the first night of my night photography workshop with Harold Davis. This was a shot of the Monterey wharf. The tungsten lighting in the original looked horrible, but I love how the photo works in black and white. 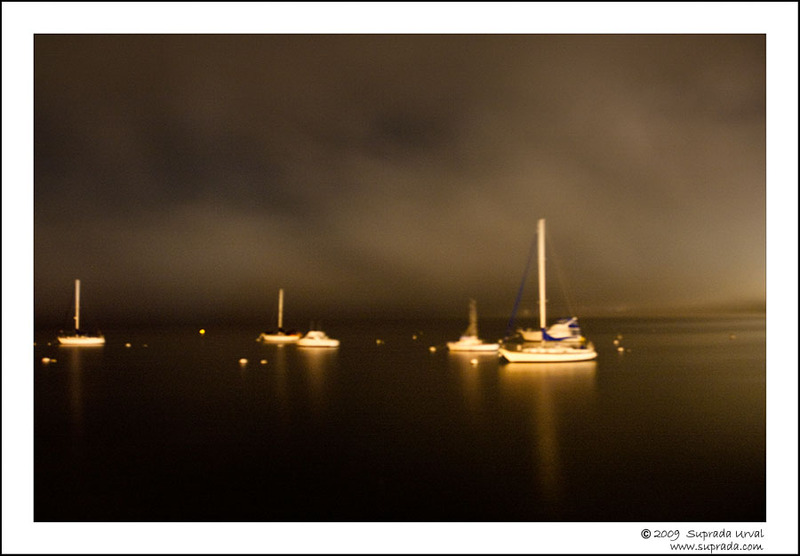 Boats at Night, by Suprada on Flickr. Boats at Night, Monterey Wharf, CA. Last weekend, my friend Yi and I took a Night Photography workshop with Harold Davis at Carmel. Before I say anything else, here is a plug for Harold\’s workshops. Harold is a great teacher, knowledgeable, gentle and approachable. If anybody is even remotely interested in this exciting area of night photography, they should consider taking Harold\’s workshop. Though I have dabbled in night photography, taking his workshop opened up new areas and new ideas about the kind of shots to take and about post processing. It also gave me a kind of framework against which to plan future night photography forays, a kind of system to the madness, one can say. We met on Friday evening at 6.00 PM at the Carmel Photography Institute, introduced each other and were introduced to Harold. After an introduction from Harold and what to expect, we set out for that night\’s shoot at the commercial Monterey Wharf. 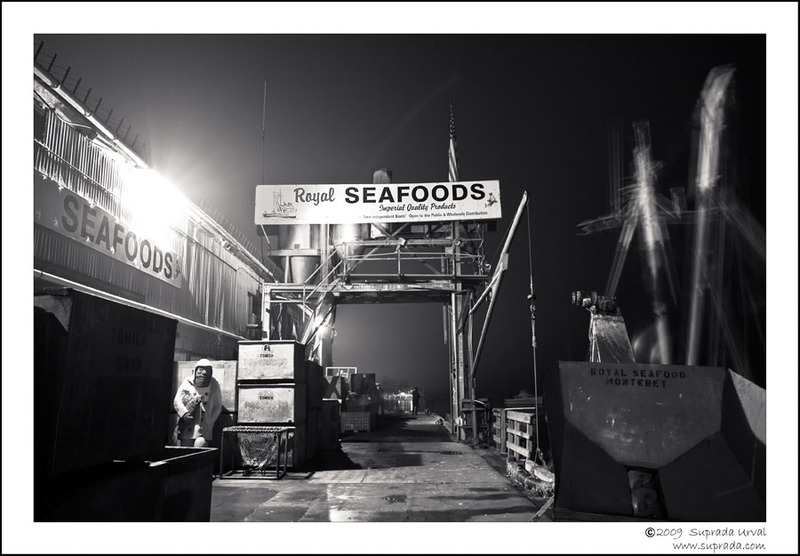 It was a foggy night, and the wharf was a good area to get introduced to night photography, kind of lit and safe. After shooting there for a couple of hours, we went home. This photograph was taken at the Wharf. because of the long exposures, you can see the boat move and blur, causing the dreamy effect. We met the next day, Saturday at 10.00 AM at the CPA. Harold showed us his post processing method and worked on each of our photos to show us how to achieve the result we wanted. It was mindblowing. We had the post processing session till 1.00PM, after which all of us decided to head out to Point Lobos for some daytime shooting. I must mention that Jack, very kindly ordered lunch for us, which we ate at a picnic lunch in Point Lobos. It was my first time at Point Lobos. It was foggy and sunny, the cliffs were glowing in an ethereal way – I\’ve never seen something like that before. It was then I concluded that, if there was heaven, it should be like Pt. Lobos that day. Photos of that coming up in the next few weeks. We were there till about 4.00 in the evening, and then headed back to the CPI, after a brief stop at the Carmel Mission. After about an hour of more post processing, we ate dinner at a Chinese place and left for our night shot. We spent some amazing time at the Bixby bridge, shooting till it got really Dark. Then 7 of us headed to Pfeiffer beach, hole in the wall rock for some more night shooting. It was awesome. We were there till about 10.30 – 11.00 PM that night. The next day, Sunday, we reconvened at 10.00 AM at the CPI for more photography talk, and more post processing. By the time we were done at 1.00 PM, I was totally exhausted 🙂 A long week at work plus a night photography workshop can do that! So that was my amazing weekend.